$4 Shipping Birthday Girl Oversized Rhinestone Tshirt. Oversized fonts in crystal clear rhinestones on black 50/50 tshirt. 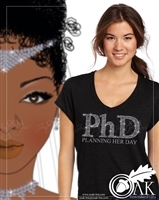 $4.00 shipping PhD (Planning Her Day). This PhD will require a lot of hard work and dedication. Hopefully, on "Her Day" you'll graduate with Honors. Available in Black Crew Neck or V-Neck. Contact OOak directly for other color options. Queening since "_____". Celebrating birthdays can be fun, jazz up your big day with some bling. Let us know the year, and we'll do the rest. Black short v-neck tshirt. 60 /40 Poly / Cotton blend. 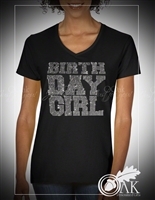 $5 size 2XL and up Show off during your birthday month with this rhinestone and glitter tee. It's decorated with clear crystal rhinestone and silver glitter on a black t-shirt. $4.00 shipping at check-out Does this shirt make me look (my age)? This simply designed rhinestone and glitter Tshirt can be personalized with your age. Sure to be a topic of conversation, as I'm certain that you and beautiful and this tshirt will DEFINITELY not make you look your age, it'll make you look much younger. Black Girl Magic decorated with clear rhinestone short sleeve tshirt in black. Show off your Black Girl Magic to the world when you're out and about. You're sure to be a conversation starter and the talk of the town. Available in a variety of styles (Lady Fit V-Neck, Racerback Tank Top or Lady Fit Crew Neck). $5 for 2XL and up Beauties / Babes in Boots Rhinestone Tshirt. Black 50/50 Lady Fit, crew neck with short sleeves. Bling it and show off your military pride whether you're active duty, veteran or retired in a very classy but, sassy way. $4.00 shipping fee will be added at check-out. Show them who you are DIVA, in this clear crystal rhinestone and silver glitter on a black t-shirt.